Today I won ticket to go and see Blue Man Group on Saturday night. Hoo-Ray! That will be a great reward for NOT SHOPPING all month. I’m happy to say that I only caved a little. I only hit Target that one tiny time. Same with Old Navy, and then I returned some of it. I didn’t step foot in Kohl’s at all, and there was very little on line shopping, either. I’m hoping that the January Amex bill will be at least 1/2 of the amount of the December bill. And the snow and cold? That helped, because I don’t really want to leave the house at all, so shopping isn’t so much of a draw. I’m getting things ready for Jenna’s birthday party on Saturday. Yesterday I made lots and lots of cupcakes. 3 different kinds of cupcakes, and then I’m going to frost them and somehow make toadstools or something out of them for her upcoming fairy party. Or so I thought. Since they frost easier if they are frozen, and since it’s a frozen tundra wasteland out there, I covered a tray of cupcakes with foil, and set it out on the trailer in the garage. Cold enough to freeze, but it’s not going to get snow on it like outside. Until the whole tray somehow fell off the trailer and onto the garage floor. Well, not ALL of them fell on the floor. A few of them landed on a stroller. Yippee. Now, I don’t know about you, but I just wouldn’t feel right about giving these cupcakes to…well, anyone, so I threw them all in the trash. There was also a great deal of stomping around on my part, I’ll tell you. Now I get to repeat the whole process (well, not the falling on the floor part, but the rest of it) tomorrow. Ugh. Wacky Wednesday and a giveaway! I have so much to blog about, and so little time! I’ll start by saying Happy Birthday to Jenna! 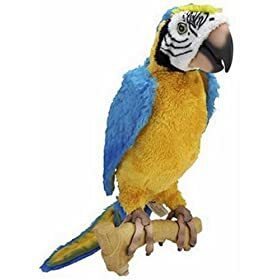 the talking parrot (as if we needed more squacking around here!) We’re planning a party for her on Saturday. But on to the free stuff! You may or may not have been aware that there’s a huge bloggage of contests going on this week, all linked through Rocks in My Dryer. At last check, there are almost 800 bloggers hosting a giveaway of some sort. Since I’m entering the game a little late, I’m sure not that many people will wade through all 755 to get to my contest, unless they start at the end and work their way backwards. So you might as well enter, right? 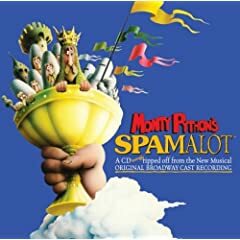 Monty Python’s Spamalot CD,which if you haven’t see Spamalot, you absolutely must! We loved it so much we bought the Broadway cast CD so we could sing the songs at home or in the car–twice! So, one of them will be given away here. 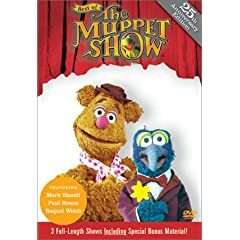 The best of the Muppet Show featuring Mark Hammill, Paul Simon, Raquel Welch. I loved the Muppet Show as a kid. I found a few of these tapes at a garage sale, and have now let my kids watch them, and they think they are weird. Of course they are weird! It’s the muppets, for heaven’s sake! But I hope whoever wins is also a fan of the muppets, or I’ll have to just keep it for myself. and two “Sue Dreamer” magnetic list note pads for the months of February and March. And whatever else I feel like giving away! Unfortunately, with the price of shipping so high, I can only offer this to residents of the USA or Canada. So, to enter, just leave a comment on this post, and if you are here for the first time, I invite you to look around and of course you can always come back after the contest. I will draw a name on Friday, and make sure I can email you if you are the winner! This has been the craziest day ever! If you don’t need to go out in the snow, by all means–stay home! It was my day to drive our preschool carpool today. I pick up two of John’s friends and take them to American Fork for preschool. I loaded John up in the car and got going, even though I could barely see past my driveway. Usually when things look really bad here in my neighborhood, they are better once I get out on the main roads. Not so, today. I picked up my two little carpoolees amid gale force winds that blew snow into the car even while I was just opening the door. I made it out onto the main road and could barely see 10 feet ahead of me. I turned on my lights, and eventually turned on my emergency blinkers, just in case there was someone sneaking up behind me. My back windshield wiper, which has been only halfway working for months, got totally wonked out and the little wiper blade was turned sideways and not doing any good at all. I figured I wouldn’t be able to see our turn-off street, so I went a little bit around (also to avoid streets without four way stops). I got the kids there only 10 minutes late, and turned around to begin my trek back home. It only took me twice as long as normal. Then, an hour later, I had to venture out again to pick up Cole and crew, as his normal carpool driver couldn’t do it. –We have a sweet neighbor who drives her 15 passenger van twice a day to take the jr high kids to and from school, and we each pay her $10 a month. Absolutely worth every penny!–As I headed up the hill into Alpine, there were two cars stopped ahead of me. I didn’t know if there had been an accident or what, but they I couldn’t really go around them, so I stopped, too. As did the car in back of me. And the 15 or so cars in back of them. After about 5 minutes of wondering what was going on here, the car in front of me backed up, and turned around. A girl got out of the truck that was stuck and motioned for me to go around her. Oh, if only I could. I spun those wheels and really tried to go forward, but really, I wasn’t going anywhere. A bunch of high school kids hopped out and tried to push the original stuck car, and I tried to spin out and go a little bit forward. Not gonna happen. The car in back of me backed up and turned around. I tried reverse, which actually worked, since it was downhill. So, eventually, I got myself turned around and back down the hill. In the midst of this, I called my friend who was splitting the carpool detail with me (because it takes two regular vans to replace a 15 passenger van) and asked if she could cram all the kids into her van, since I wasn’t getting up over the hill today. Ugh. I made it back home, and found that my stomach was in knots from the stress of driving. As I was pondering how I was going to make it in another hour to pick up John, my friend Lisa called me. She had to go down that way to pick something up, so she would get the boys from preschool if I could pick up her girls from school. Seems they had grounded all buses and the parents had to pick up their kids. GREAT. So, I threw on my boots and went out again to go and get my girls and her girls from the elementary school. Ring Ring! It’s my neighbor telling me that police have closed the main road and I should go the other way by the city office. OK, so I went the roundabout way. As I got by the other Junior High, what do I see, but buses coming out. And a whole lot of cars. Major traffic jam. I eventually get to the kids’ elementary school, and I don’t see huge lines of cars there as I had anticipated. I am 10 minutes later than I thought I would be, after all, but I wonder where all the moms are. I call into the school, and the secretary tells me that the buses did take off about 5 minutes ago. So, then I have to hope I can still beat my kids home, so they won’t have to trudge around the house to get in and have more reason to complain to me. I did indeed beat them home, and hat water heating for the required hot chocolate by the time they got home. What an exhausting and crazy day. I did a lot of driving for not a lot of good. A lot of “spinning my wheels” as it were. Now, I’m just going to stay home. Never to leave my house again. At least it’s stopped snowing and the wind isn’t currently blowing. (I’ve decided to enter this post in the “travhell” contest going on at ..and the pursuit of happiness Even though it’s not much of a “travel story”, the frustration level is there, don’t you think? Last night at dinner with friends, we were talking about President Hinckley, and how although he seemed old a frail, he was still in good humor. At the MoTab Christmas party in December, he was presenting an award to John Longhurst, the Tabernacle organist who was retiring after 30 years. He said, “John, when you get to be my age, oh never mind, you’ll never make it that long, but you can try.” We all laughed and were impressed by his wit. Last night our beloved prophet died at the age of 97, and we are happy for him. He has given years of service and lead the LDS church through so much growth. He is loved and will always be remembered. But I am happy that he will be together with his wife, who he loved so much. We will miss you, President Hinckley. I’ve never been one to cut my own hair. Maybe I was seriously scarred as a child after a bad haircutting experience, I don’t know. But I haven’t been blessed with a hair cutting talent. And I haven’t studied and learned it as a skill. I just don’t cut hair. Even with little kids, I can barely bring myself to cut bangs or even out their hair in the back. When the boys need hair cuts or it’s time to do a buzz, I let Ryan wield the clippers. I don’t even trust myself to do that. Once in college, I had a roommate who made me cut her hair. I told her ‘No’, but she made me do it, anyway. “Just cut in a straight line starting here,” she said. Well, I cut, and it was a straight line, but it started at the level she wanted it, and by the time I got to the other side, it was about two inches shorter. She was rightfully mortified at what I had done to her hair (although it was the late 80’s and asymmetrical hair cuts could have been in back then). She called in a different roommate to fix the botched hair cut I had given her. Now WHY she didn’t just ask her in the first place instead of traumatizing me, I don’t know. So, after the haircut was fixed and even and all that, it actually looked really cute in a bob. Even though that wasn’t what she had been going for in the first place. So, really, it was my creativity that helped her get a really cute haircut, right? Later, when on my mission in Germany, I had a companion ask me to trim her hair for her. It was very long and she just wanted me to cut off a couple of inches in the back. Oh, NO, I told her, she wasn’t going to fall for that trap again! I told her of my previous hair cutting experience, but she still persisted. Unlike the roommate, she had thin hair and I could just bunch it up in the back and cut it all at once. I did manage to do that one tiny haircut without calling in reinforcements, but I still have no desire or talent to cut hair. So when I woke up Saturday morning so irritated with my hair that I was ready to cut it, I knew something was seriously wrong. I never cut my own hair. I make an appointment and wait for the trained professionals to do it. I mean, what if I mess it up? It’s not like I have thick bushy hair and I can afford to lose any of it. But I’ve been really irritated by the “bangs” situation here for a while, and I guess I just went over the edge. You see, I’ve been trying to figure out if I want to grow out the bangs and just push it all over to the side, or still have some bangs. I’ve tried to do the long chunk of bangs that just kind of sits to the side, but I guess that’s just not a look that my hair can master. So. Yesterday I just got out the scissors and cut a few pieces of bangs. By myself. With my plain old scissors that are usually used for cutting off tags that I keep in the bathroom. Brave, huh? Or maybe it was just stupid. I’m realizing that they are not even, but I think I can deal with it until I get an appointment for a real haircut. I hope. Don’t they know it’s cold out there? Yesterday I had the privilege to supervise the playground during lunch recess. Yi-pee. I could barely contain my excitement. I actually spent the day wresting with myself to decide if I really was going to go, or if I should just flake on my obligation. Well, my conscience won out and I went and did my parental duty, grumbling about why in the world my daughter’s class had to be in charge of a week in JANUARY. But I was prepared. I bundled up with a coat, a scarf, gloves, a hat, and even a pair of handwarmers should I need it for my 45 minute outside ordeal. When I got there, I saw all the kids out there in sweatshirts or coats, some with gloves, but most without, and all with a severe lack of headgear. What? Are these kids crazy? Well, yes, actually, they are. But I was pleasantly surprised that it wasn’t as cold as I had thought it would be (a balmy 27 degrees), and the kids were fun. But I’m not signing up for any more of those until maybe….May. And to add to the fun and excitement, I’ve decided to do a little giveaway! These are just a few of the ones she has to offer. Here’s what you do: Click over to Amy’s blog site and see which of her prints you like the best. You can leave her a little love in the form of comments if you want, just to let her know you were there. Then come back here and leave a comment and let me know which of those lovely prints you would like. I will draw a winner on Friday, and that person will be able to have an 8 x 10 of their choice. If you want a bigger size, I’ll apply the 8 x 10 cost, but you’ll have to pay the rest. So, click away, enter the contest, and then come back on Friday to see if you’ve won! Tag, I guess I’m it. Oooooh, I hate it when a post that I’ve worked on for a long time just disappears. Arg! So, I’ll do it again. I’ve been tagged by Forgetfulone for a meme (really, what does meme mean? Is it so much about me that I have to say me twice? ), and although this is late, I’m playing along. Five random or weird facts about me. Even though this may not be new to those of you who know me, since I far too often say exactly what I mean and my life is an open book, right? 1- When we moved to Illinois, I decided to change my name from Paige to Jess. I’ve never really loved the name Paige, and since I have no middle name, had to create my own. What’s weird about that? 2- I don’t eat broccoli or it’s evil cousin cauliflower. Ever. Yuck. And you can’t make me. 3- I like to sing along to the songs on the radio, and if I don’t know the lyrics, I just make something up. 4- I’ve never had a bloody nose or a broken bone. 5- I love candy cane ice cream. Yum. So, there you have it folks. I had actually tagged 5 people and included links to their blogs, and I think I emailed them, but then all that disappeared. So, if you would like to play along, let me know in the comments so I can find out 5 random things about you! Way back at the beginning of December, I mentioned the the kids had entered a winter art show, and done very well. Well, since that time, I’ve been meaning to post pictures. Their artwork hung in the library until the beginning of January, and I finally got it back and took some pictures. This one is Natalie’s (age 9) and I love how it turned out. She did such a great job. I love the elf, and how he’s facing away from us. She earned a first place ribbon and $5. Jenna did this snowman scene. She’s done quite a few snowmen this winter season. This one is Megan’s Santa picture. I’m really proud of her, and think she did a great job. She won best in show, but then the show is only for kids ages 5-11, so as an 11 year old, she had a sincere advantage. Along with her big ribbon came a cash prize of $20! Today I went with John’s preschool class bowling. Oh, what fun it is to take 18 4 and 5 year olds to the bowling alley! Really! I only had three kids to look after on our lane, and they are all kids I know. So we had a good time! With bumpers and those rolling things, those kids can do pretty well. I think John scored an 89 and his little friend Hunter scored a 90. Hunter was very pleased that he had WON and talked about it all the way back to school. “That was so much fun, wasn’t it boys?” I said. “Yeah, and I won!” said Hunter. But even if they didn’t win, I think all the kids had a good time. c)find something to do closer to the school. I chose option c, and decided to go and get my van washed. It’s soooooooo dirty, you can’t even tell what color it is. Especially since I was driving right behind a snowplow the other night while it was dumping out salt. Ick. So, I drove the short drive to my favorite car wash, and there was a HUGE line. I guess I wasn’t the only person fed up with their disgustingly dirty car. No WAY was I going to waste my kid free time waiting in line for the carwash. And look, there’s Target right over there. But I’m not shopping. Oh, I’m torn! I needed a new exercise ball for our ball class on Tuesdays, and a friend had tipped me off that they were on sale at Target. So, I walked directly to the exercise stuff, found a ball for $9, and started back to the checkout. I was sidetracked by the HUGE sale on paper towels and toilet paper and did fall into the temptation of the sale (30 rolls of Charmin for $9–who could pass that by?!). But even with the exercise ball, the toilet paper and the paper towels (also on a major sale–$4.90 for 12 rolls), my purchases were under $30. -Whew!- I made it through Target without overspending! Hooray for me! But I still had about 25 minutes, and I knew I couldn’t get my car washed in that time, and there’s an Old Navy just three stores down, and everyone at Book Club last night was raving on and on about the sale at Old Navy…….and…… I’ll admit it. I caved. I’m weak. The song of the shopping was just too strong for me. I did a quick whirlwind shop at Old Navy, and my, oh my, would you look at these prices! What? 75% off?! You have got to be kidding! I tried to keep it under control (and I didn’t have much time), so I just got a shirt for Cole, a shirt for John, a shirt for Ryan (think valentine’s presents, right?) and I picked up (gasp) three pairs of pants for me. Pants that were $8 something each! If you think I was being excessive with my purchases, you’ll be relieved to know that at least 2 and possibly 3 of those pairs of pants will be returned to the store. I didn’t have time to try anything on in the store, so I just brought them home to try one. Mid-rise, my behind. Which is what you would all be seeing if I wore those pants. I won’t elaborate, but let’s just say they don’t fit well. So, there you have it. I shopped. I couldn’t even make it a whole month without shopping. I am weak. But this was just a moment of weakness (well, more like an hour) brought on by the fact that the line at the car wash was JUST TOO DANG LONG. I’m not going to let this tiny setback throw me back into the arms of the lovely siren called shopping. I set out to avoid the shopping for this month, and I will still do it. This was just one little slip-up. I blame it entirely on the car wash place.